With more than a million square feet (90,000 sq m) of space, Harrods sells luxury and everyday items across seven floors and 330 departments. Its motto is Omnia Omnibus Ubique - All Things for All People, Everywhere - and the store attracts 15 million customers each year. 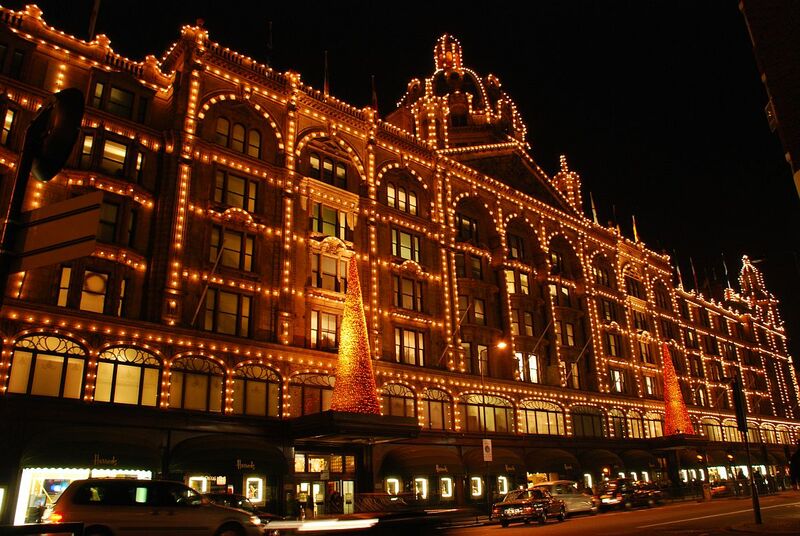 The Knightsbridge store was established in 1849 by Charles Henry Harrod. Beginning in a single room and employing two assistants and a messenger boy, it mainly sold tea and groceries. Harrods steadily expanded, and by 1880 was a thriving department store, offering everything from medicines and perfumes to clothing and food and attracted wealthy customers Known for its grandeur, when the store reopened it had a palatial style, featuring a frontage clad in terracotta tiles adorned with cherubs, swirling Art Nouveau windows and was topped with a baroque-style dome. During World War II, the store transformed itself from selling luxury goods to making uniforms, parachutes and parts for Lancaster bombers. You can smell this café before you can see it. The delicious aroma of sweet, melted chocolate filled the air, turning the heads of a few curious shoppers passing by. Situated on the second floor, hidden behind the busy gifts section, the Harrods Chocolate Bar is a welcome break at any time of the day. The café offers everything from light snacks, to satisfy to the early-morning shopper, right through to a heavier choice of treats to suit tired shoppers at the end of a long day. The strong chocolate theme is evident in everything from the decor to the menu, and even in the aprons of the waitresses. Brown leather stools surround wooden tables and a granite stone bar sits in the middle of the bar at the front of the café. The food is delicious served warm,The menu, however, boasts numerous chocolate treats, all served with an essence of luxury and class. The bakery offers chocolate cookies, peanut butter brownies and the toffee and pecan cookie is highly recommended by staff. The patisserie section describes the clotted cream cheesecake and chocolate fudge cake as the perfect snack, as well as the molten lava chocolate cake. There are also luxury offers to indulge in, in the way of a chocolate fondue, to be shared between two people. This includes strawberries, bananas and loaf cake to be served with a choice of milk, white or dark chocolate at £25.00 and a triple chocolate option for £27.50. Harrods Chocolate Bar proved to be the perfect stop-off for any passing shopper.